Many a tent and marquee were last seen heading in the direction of the Antarctic, while drivers and spectators leant forward into the driving rain. Umbrellas were a waste of time as the rain drove sideways. Perhaps the storm scene from Shakespeare’s King Lear? Not quite, but more like Phillip Island during the March 2009 Historic race meeting. Rod Smith of Classic Wiring Looms had set up his trade stand to extol the virtues of his business to the fellow enthusiasts. Like anyone else, Rod braved the elements and as with everyone else – lost! When Classic Car Gurus spoke to Rod a few weeks later he was still drying out his equipment. There is nothing more annoying that intermittent electrics in your classic car. Anything from faulty headlights through to under dash infernos can really spoil your day. Sometimes it’s a simple repair, while at other times it’s best to start from scratch. Take a restoration for instance. Surely during such a labour of love, the last thing you would do is to reinstall your old wiring harness? 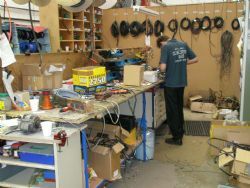 That’s where Rod’s company Classic Wiring Looms comes to your assistance, for they have over 400 drawings from which they can make a new wiring looms for your classic car. Rod Smith has been in the automotive electrical business for most of his working career. Like so many of us his father had a few cars and bikes and Rod found himself enthralled with the electrics of the vehicles. Although Rod freely admits that as a youngster he really didn’t have much of an idea how it all worked. However it did spur him on and was instrumental in his decision of becoming an automotive electrician. With his career path chosen, Rod served his apprenticeship with a Lucas representative and found himself working on a wide selection of boats and cars. He recalls with some enthusiasm being asked to completely rewire some cars with new harnesses. By the 1980s Rod had set up shop in the Melbourne suburb of Clayton and was quick to notice the emerging classic car restoration market. In a decision that was destined to have a renowned effect, Rod decided that there was a growing need for new wiring looms. As so many classic cars were fitted with cotton bound looms Rod needed a braiding machine. However that was easier said than done and he would eventually find three from which just one working example would evolve. The next task was to set up a display at the Bendigo swap meet and to say that success followed would be an understatement. Classic Wiring Looms was under way. Rod recalls that he initially was supplying looms for historic racing cars and then in 1998 was asked by General Motors to produce the looms for two 48-215 Holdens as part of the re-enactment of its launch. Kenworth also asked him to do the same and using original drawings brought in from the US he made a new loom for the first truck sold in Australia by Kenworth, now freshly restored. 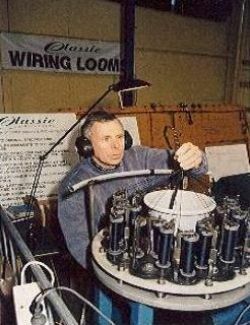 Since then there have been any number of cars fitted with a new wiring loom from Classic Wiring Looms. From a Ferrari 750 Monza to a Bugatti Atalante. From Porsche 356 to Speed 6 Bentleys. Plus of course everything in between. When we spoke to Rod he was installing a new loom into a Datsun1800 that was being prepared for the East African Safari. Rod is also very comfortable with upgrading your loom to accept such modifications as the fitting of dipping headlights, indicators, brake lights, cooling fans and so on. In fact Rod can set the machinery to accomplish almost anything a customer could possibly want. 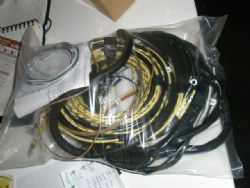 Rod can also supply whatever style of wiring braid the customers requires such as lacquered coated braid that comes from overseas and is especially popular with some valuable cars. However Rod does find that most enthusiasts are quite happy with the colour coded PVC coated wire. However recently Rod did produce a new loom for a Lancia Aurelia that was all black with each wire fitted with aluminium tags. While 400 wiring loom drawings might seem a lot, we were interested if someone wanted the 401st. Rod didn’t seem to bat an eyelid and said it was a matter of the owner either bringing the car in or producing a simple drawing themselves with approximate measurements. Rod would then produce what is actually a trial loom and send it back to the owner for trial fitting. After that it would be returned to Classic Wiring Looms for modification and so on. Rod said that it can take a little time, but the results are always worth it. It’s worth noting that while Classic Wiring Looms do not undertake general automotive electrical work, they do however carry out the occasional 6v to 12v conversion. 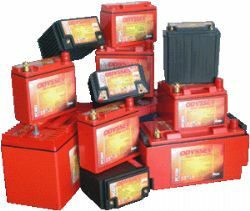 Another feather to Rod’s bow is that through his other company Extreme Batteries, he is one of Australia’s biggest sellers of ODYSSEY Batteries.